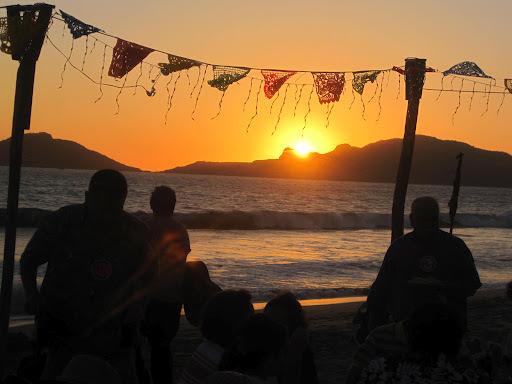 Throwing a Party Mazatlán Style | ¡VidaMaz! 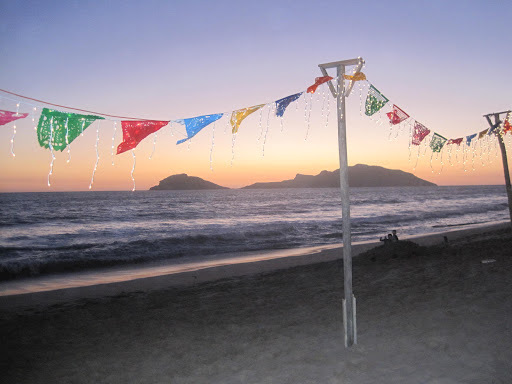 Mazatlán is famous for its wonderful people, beautiful surroundings, and its laid-back party atmosphere. We’ve hosted quite a few parties in our time here, and I thought it might be interesting to explain a bit of what we’ve learned is involved, and how hosting a party here may differ from what you are used to. It’s affordable. So, please have a party and invite us! Plan on feeding everyone: every vendor, every helper. Even though they say you don’t have to, they will eat and will expect to eat. Some things are unbelievably easy, and some things just so aren’t. It pays to have friends, who also have friends (“I know a guy who…”). For any party you of course pay close attention to who you’re inviting, making sure the guests will mix with one another well. Here in Mazatlán, more often than not, that means paying attention to language. Some people speak only Spanish, some only English, we have quite a few French Canadians living here, and of course some who are multilingual. So, a major party concern is language mix. A second concern regarding guests here, that we didn’t pay much if any attention to when we lived in the US or Japan, is status. We very much like to bridge socioeconomic differences, mixing the working class with the executive or professional class, for example. We have 30+ year friends who used to live in the US, for example, who have returned to Mazatlán to live and work. Many of the new friends we have made here are business owners and professionals. Mixing these very different groups of people can be awkward, though we give much credit to our local friends who have been game to embrace the mix with us, learning from it and enjoying it. A third thing that comes to mind is that people in Mazatlán tend to party as a family. We have found that when you invite people to a party, they will usually assume children are welcome. We have not found a way to say “no children” in a socially acceptable manner, and rather have inadvertently upset a few friends in our attempts. It’s also important to think about who comes to a party in Mazatlán. It was typical when we threw a party in the US that we invited people, they rsvp’d, and then at least a couple of those who said they would come did not show due to last-minute realities. So, we tended to end up with fewer guests than planned; rarely if ever more. Mazatlán by contrast is a very inclusive place; people assume you’ll invite everyone you know, and that everyone you know is welcome. Thus, parties quickly grow larger than you might want. Friends may bring their parents, aunts, uncles, cousins or friends along, and acquaintances who pass by will fully expect to be invited to join in the fun. You always want to leave room for more guests than you anticipated. I guess another thing that has fascinated me about parties here is how little people mingle. I remember our first holiday posada in our new home. We expected a cocktail party, which to us meant people moving around and getting to know one another. Well, our guests walked in, found a seat, got up to refresh a drink or get more food, only to sit back down in the same seat they’d started in, next to the same people they arrived with. A typical local party will see people sitting down in plastic chairs and not moving most of the night. They often sit with their families or friends, losing the opportunity for new connections and some terrific conversation. Part of what we love about a party is that our friends get to know other friends; we hope that people will mingle. We have gone to all sorts of lengths to encourage this to happen, from how we set up the chairs and furniture, to structuring an activity or game, or pairing people to help with something, just to encourage them to get out beyond their “normal” circle of friends and family. I mention this just so you aren’t surprised. A key thing to realize about a party in Mazatlán is that it’s most often held out of doors, either in someone’s driveway or patio, or at the pool or on the beach. If you plan to hold a beach party, remember to check the tide charts and set up your tables accordingly! The norm is that the host orders in plastic tables and chairs on which the guests will sit. It is very inexpensive and very easy to have these items delivered and then picked up after the party. For a nicer party you may want tablecloths to cover those gorgeous white plastic tables. More often than not in the US, when we had quite a few tables, we’d buy disposable tablecloths, plastic or paper. Here in Mazatlán it’s very easy, common and cheap to rent linen tablecloths. They come in all sorts of colors and styles. The rental place delivers the tablecloths and even puts them on the tables, and picks them up and launders them the next day. These places rent linen napkins as well, but good luck if you want napkins that actually match the color of the tablecloths. That would be asking too much. My advice is to choose a color scheme and mix it up. Now, since parties are often out of doors, using tablecloths presents a challenge. Perhaps that’s why people so rarely use them; they blow up and about. One would think you could buy tablecloth clips in this town, but, no, we have not been able to find any. We bought a whole bunch of such clips last summer in the US. They have not weathered well, however, as when local people help us clean up after a party they don’t know what the clips are or how to use them, and end up breaking them when removing them. We’ve tried using large paper clips and laundry clips, which work well if you have the right kind of plastic tables. When you have thick-topped tables, the best bet we’ve found is to use ribbon or yarn to tie the tablecloths around the legs of the tables, forming a decorative bow in each corner. Most parties here use white Styrofoam plates, white plastic forks that break easily, and Styrofoam or clear plastic cups. It’s non-festive and definitely not “green.” If you are ok with those things, you’ll find them easily. Anything other than that, get ready to spend some time looking and planning. My advice is: enjoy the process. It’s interesting to us that people here don’t really seem to use napkins. It’s amazing how we can put them out, and at the end of the night, we still have most of the napkins left, unused. If people put out napkins at a party here, they are most often tiny white paper napkins, and they are most frequently used to clean off the tops of the beer bottle before you drink. For our latest party we wanted some festive, colored paper napkins. Good luck on that. We ran all over town searching for them. Between an import party supply store, a generic import store, and WalMart, we were able to find some, but we couldn’t find large quantities of colored paper napkins that matched. A terrific gift for your friends here is to bring funny or pretty cocktail napkins when you visit; they are definitely something we can’t find here in Mazatlán. Ditto on cups. If you use the ubiquitous Styrofoam or clear plastic cups, you’re fine; finding plastic cups in festive colors can be done but may not be easy. We also keep a supply of a case of inexpensive wine glasses. The other major difficulty we have had is with plates. The only easy alternative to the infamous Styrofoam plates (which in addition to their horrible effect on our planet is the fact that they blow away in the wind, making it challenging to eat out of doors) is to rent tableware. But, the rental places rent china, which we feel is far too fancy for the average beach/pool party that we host. We’ve ended up purchasing inexpensive colorful plastic dinnerware that we wash and keep for the next party. Friends of ours have, like us with our plates, purchased inexpensive sets of utensils (forks, knives, spoons) and keep them for parties. We’ve also done this with wine glasses. The most common appetizer here is, of course, ceviche. In our experience it’s very common for some of your local guests to offer to bring a ceviche to share. 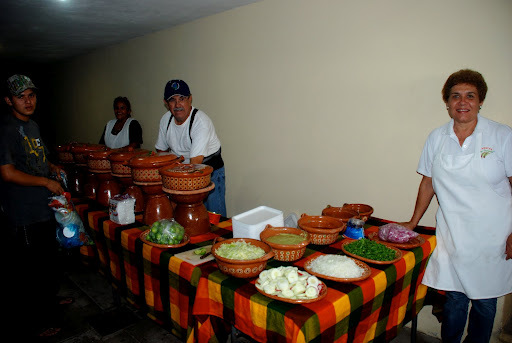 You can also purchase ceviches from the market or from a restaurant. If friends offer to bring something, you might also want to ask them to bring some guacamole. Bags of tortilla chips can get pricey, and it’s much more common locally just to see bags of tostada shells for eating the ceviche and guacamole. The challenge is, if you are having a party outside, how to keep the food chilled? Our best find thus far is to use a large, shallow clear plastic tub, like an under-the-bed storage container, and fill it with ice. You can set your bowls or platters of ceviche or whatever on top of the ice and keep it nice and fresh. Main dish-wise our favorite party includes a taquiza. 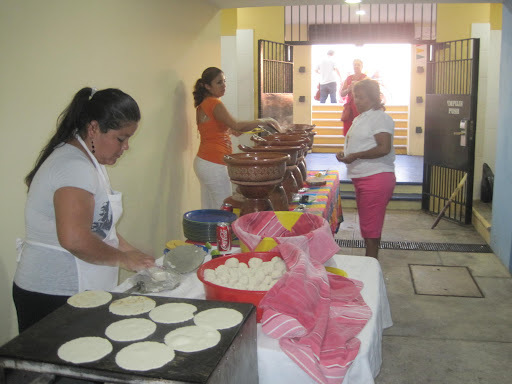 The food is fresh, easy to eat, has something for everyone, and is reasonably priced (about 40 pesos/person). Nearly everyone locally has their favorite taquiza. A taquiza is usually a group of women in a family or a neighborhood, though it can be a full-fledged business. They come out to your party with tables, a comal on which to cook tortillas, and all the pots and pans they need to heat and serve taco ingredients. Most taquizas will let you choose 3-5 guisados or main ingredients (pork, beef, shrimp, rajas/chiles and cheese, chicken), and they will also bring the sauces, cilantro, limes, onion, and usually some aguas frescas (flavored waters such as cebada, jamaica or horchata). An alternative to a taquiza and also very common at parties is carne asada, or grilled steak, usually served with grilled onions and taco trimmings. Children’s parties often include a hot dog cart and an ice cream cart, in addition to a piñata, of course. 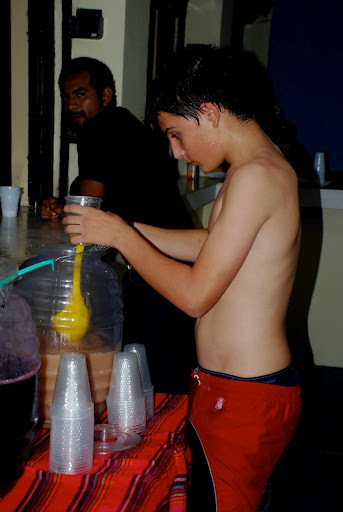 Beer is the main drink of choice at a party in Mazatlán. The nice thing is we have the brewery here. If you order beer from the brewery, they will deliver it along with a large cooler (hielera) and ice, right to your party location and without extra charge. A large metal pail filled with ice can hold wine, sodas and white wine. If you are having a large party, we highly recommend that you hire a helper or two. This could be the person who cleans your house, her friend, or a favorite waiter or bartender. Hiring assistance is not so expensive in Mazatlán, and having someone to help set up, clean up, and serve so that you can better enjoy your guests may be well worth the price. It’s most common at a party to play music from the stereo or iPod. Greg loves music and he has spent loads of time creating perfect party mixes. Key for us is to have an eclectic mix of local and international favorites, and a mix that also spans the generations, to keep everyone engaged. Music from a stereo or iPod becomes more challenging if you have the party at the beach, as the sound gets drowned out quite easily. We solved that problem by buying a large iPod-compatible (and USB-compatible) speaker from an electronics store. It’s also fairly common here to rent a rockola. This is a computerized portable jukebox that is also a karaoke machine. For about 500 pesos/night a rockola can be set to play tunes, your guests can choose the tunes, or your guests can use the microphone and sing along. Special event parties here may employ a sonido, or a DJ who brings sound, video, and a light show. We’ve been to several teenage events that included the DJ and light/smoke show. Recently when we hosted our friend’s quinceañera, they brought in a sonido that was really impressive. It included the MC for the night, music to dance to all night accompanied by video, laser lights and smoke. But, amazing to us, the DJ had also put together a video show about the birthday girl. It included a slide show of childhood photos of her, but it also included professional video of her walking around at the marina, looking every bit the professional model. They told us the music, DJ, custom video, and photography package (her quinceañera photo shoot) cost them only 5000 pesos total! Mazatlán is of course blessed with incredibly talented musicians. From guitarist-singers, trios or small groups of classical musicians, to full-on 20-piece banda, live music is an obvious crowd pleaser and makes a party feel special. Mazatlán is also home to terrific fireworks, and at very affordable prices. If you want to add a memorable touch to your party here, don’t fail to consider the fireworks option. You can order the big guns, you can have land-bound fireworks made with your names or the name of your event, and you can even push the button to light the fireworks or give that privilege to the children on your guest list. Obviously for a smaller home party you won’t need to decorate, beyond some background lighting and a few candles. But, for a larger party or a special occasion, Mazatlecos love to decorate. There are blocks of papelerías downtown that specialize in party decorations, and you are depriving yourself if you fail to take a leisurely afternoon enjoying the incredible colors and fun frivolities available there. For our latest beach party we bought strings of white Christmas lights, and hung them from puntales that we rented for 10 pesos each from a construction supply store. Over the strings of lights we hung colored banderines or strings of colored plastic “flags,” a typical Mexican party decoration. It looked gorgeous. We had also purchase lengths of colored plastic, intricately cut into decorative streamers. I’ve never seen anything like it elsewhere. Traditional centerpieces are flowers, and every florería will be happy to make some for you using gorgeous and reasonably priced flowers. We have learned two lessons the hard way: if you are having a party on the beach, make sure the centerpieces are heavily weighted so they don’t blow over. Also, it’s common here for florerías to make tall centerpieces that cause difficulty when you’re trying to talk to someone across the table. Be sure to give specific height instructions. 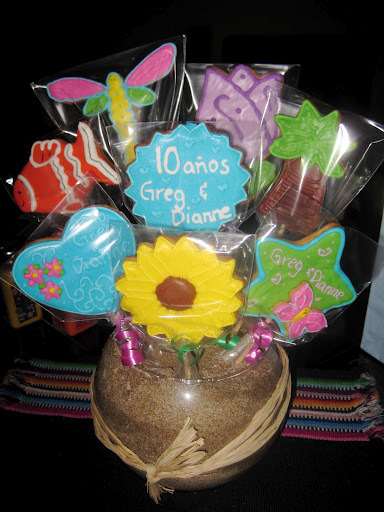 Another option we used for our last party were centerpieces made of cookies. These served the double purpose of decoration and dessert and the great thing was that the baker totally customized the cookies to our event, putting our names, the event name, the date, and using cookie cutters that matched the theme of our party. They looked and tasted fantastic. Ok, you’re laughing. Yes, most people in Mazatlán have parties and don’t get permits. But, a permit is a city requirement. I’m not sure of all the details, maybe it’s only a requirement if you have music, or if you use public spaces. But, the city office that handles party permits (2nd floor, on the left, of the city hall which is next to the cathedral) is a VERY busy place. If one of your neighbors calls the police, you may wish you’d obtained a permit. I’d advise it especially if you are going to have loud music playing. The process is simple: you go to the office, fill out a form, pay some money, and are given an official stamp. If you are hiring musicians, be sure to take a copy of the contract with you. The form requires you to state how many cases of beer and wine you will serve at the party. Beaches are federal property. If you are holding the party on the beach, you will need a permit issued by (#((((. Locally they require one-month’s advance notice. We’ve had beach parties with permits, and we’ve had plenty without. Parties here tend to start later than we might be used to in the States: 8:00 or 9:00 pm start is very normal, and guests might not arrive till a couple of hours after your official party start time. Be prepared also for parties here to go much later than what you may be used to: 3:00, 5:00… We are proponents of a cross-cultural mix, and I know from experience you can have a good party and not let it go on till the wee hours; it is doable. What a great post, Dianne! Although I could never even begin to aspire to your exalted party-giving status! And you really topped yourself with your anniversary party… I know I'm not the only one wondering what you'll do for your 15th! Wow! What a description. Everything is here! Congratulations, Dianne. This is an excellent work. I'm a mazatlecan. 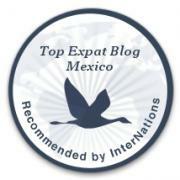 I live here and I also write reports and reviews about Mazatlan, but yours show a deep understanding of how mazatlecans are; no biassed or prejudiced comments can be found. Thank you for your valuable vision. Thanks, Nancy. We are sooooo lucky to have such terrific friends like you and Paul. Maybe for our 15th we all take a trip somewhere? 🙂 That would be fun! Muy amable, bloglogger/Luciano. We absolutely love living here; mazatlecos ROCK. I am so glad you enjoyed the post. Please help keep me on my toes. Oldest active surfer in Mazatlán?! We've got to go out and watch you one day–let us know! Interesting about the required permit(s).In our area on the eastern coast side of Mexico party givers often block the street(s) off with large, white painted rocks. People, including public transportation, are quite respectful of this inconvenience – now I am wondering if they actually have a permit for this and the rest of the hoopla?Good advice – gracias. We hope to get to Veracruz someday, Calypso, and I would love to attend one of those parties with the painted rocks blocking the streets! Here I'd say it's more common for people to block the street by parking cards sideways, or putting out trash bins or somesuch.